If you exist in a work environment where you have to manage multiple shipments every day (if you know the FedEx and UPS AND DHL delivery guys by name) then I’ve got a website that will completely rock your world. Here’s how it works: simply forward them the shipping confirmation email that contains the tracking number to track@trackmyshipments.com. 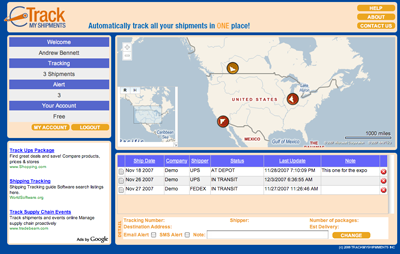 Then, the utility identifies your email address, the shipping address, and the tracking number. Simply log into the website and see all your shipments in one window.